September’s free 2018 #avgeek #wallpaper is live on the “Monthly Wallpaper” page. For #RAF100 – The RAF Search and Rescue has formed an important part of the service until the duties were taken over by Bristow in 2015. 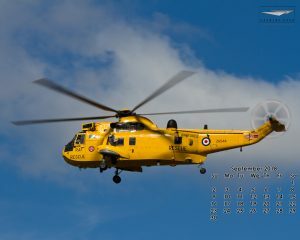 The bright yellow Sea King ZH544 of 22 Squadron, here seen at Dawlish in 2013, was the last to leave RMB Chivenor on it’s way to the Norwegian Air Force.